Not long back I had a shocking experience. I was speaking to a woman who was sharing with me about attending a mega church in my city. She is attending this church for many years and finds it exciting to be a part of its service. And then she shared with me that there is also a bible study being conducted every week in her house by another group. Do you know who they are? Jehovah’s Witnesses. I was shocked to hear this. I asked her whether she knows who Jehovah’s Witnesses are. She has no idea about them. This woman is attending an evangelical mega church since many years, yet she didn’t know that JW is a cult in which many sincere people are entangled by its false teachings. The members of JW have penetrated her house to digress this family from some of the cardinal truths of the Holy Bible. When I explained to her who JW's are, she was taken aback. Now this woman is passionate for God and sincerely loves to follow Christ. But she is part of a mega church in which she could not have the opportunity to get discipled by someone towards spiritual maturity, even finding help to get strongly rooted in the Word of God. She didn't even know that being discipled is essential for Christian growth. 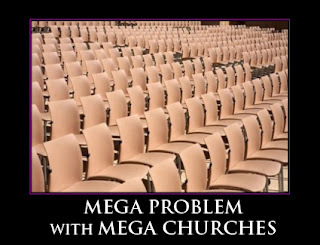 This I find to be a mega problem with mega churches. Please don’t get me wrong. 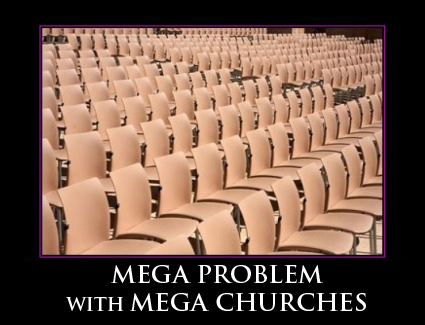 I am not completely against mega churches. I am not saying there is nothing we can learn from them. I find the services of these churches quite exciting, which is good. They constantly conduct special programs and concerts, have exciting youth gatherings and provide good facilities for the attendees, which is helpful. I see there is a great emphasis on evangelism and church growth, which is wonderful. But here is a mega problem with mega churches—there is a great lack of personal attention and mentoring of those who are newly born-again. Even those who would like to grow more in the Lord, they lack proper guidance and motivation. And the equipping of the saints for ministry is largely absent, for the necessity of body ministry is not recognized by these churches. What I have observed is—mega churches are more service and program oriented than focused on discipleship. For this reason, the faith of many members of these churches is found quite shallow. Much worse, there would be many having no salvation experience and I wonder what focus is given to personally lead them to Christ Jesus! Of course, this pathetic condition could also be found in micro-churches if believers are not properly nurtured and discipled. Is it not our Lord’s command to make disciples rather than have nice Sunday services and programs? I have observed that those who grow well in the Lord in a mega church setting are those who have a passion to grow in Christ with a self-disciplined spirit, taking initiative to stay on the cutting-edge. And some who grow well in these churches are those who receive inspiration to grow from other fellowships or bible studies or ministries. An active member of a mega church agrees with me that, although the churches are mega in numbers, we find few people testifying their immense growth in the Lord and in depth understanding of His Word due to the contribution of these churches. But those who are not self-disciplined and have no proper guidance from outside and could not take initiative to find help—they remain in these churches for years without personal, evidential and influential growth. They may appear emotionally spiritual but show no true signs of solid biblical understanding and spiritual maturity. O, how such people can be wonderfully transformed and used by the Lord to impact the people around them if an initiative is taken to mentor them in the Lord! To resolve such problems, since it is practically impossible to pay attention to all the crowd in a mega church setting, some have adopted cell group method, appointing cell group leaders to lead. This is at least better and somewhat helpful, although there is a fear whether these cell groups may cut off from the mother church and become an independent church. However, even to such cell groups many do not seem to consistently attend, for to them church is a Sunday service to attend, not a close-knit community to grow in the Lord and to impact the world. Such people may be more transformed through personal discipleship. Most Jehovah's Witnesses are decent folk who are trapped in an oppressive cult like organization the Watchtower society. The Watchtower core dogma is Jesus 'invisible' return or second coming October 1914,this is a false doctrine. Matthew 7:15-16 "Be on the watch for the false prophets,who come to you in sheep's clothing....."
Wonderful points you brought out. Hope that people consider this when they look for a home church. I have been a member of a mega church and realized it was easy for me to get "lost" in the sea of membership. My husband and I are attending a smaller church and really enjoy the intimate setting. It is much easier for me to walk the walk of Christianity with such a close knit community. There is a built in accountablity that I found missing in the mega church. Thought provoking article. Mega Church is no church at all. They are convention centres. None know each other, no personal attention, no spiritual mentors, no growth, nothing. A clever means of fund collection. Greedy wolves begat greedy wolves. Seeds of greed are sown sunday after sunday and meeting after meeting. Making a very broad highway to hell.Many travel comfortably through that road every day. Large and mega are more attractive for our pride of life.One can say with his head high in the air that I belong to so and so congregation. Who care for a home church. Hi Bobby, I do not completely discard mega churches. God is working in and through these churches too. We have to see how they can become more effective and fruitful for the glory of God. Stephen, Churches don't save people... Disciples do. While I see your emphasis on a Godly personal involvement between believers, in each other's life to be commendable, it would be wrong and downright divisive to compare JV with all Mega churches. I have personally witnessed problems in both Mega and Micro churches and its nothing to do with the model but with the people involved. While Mega churches need to challenge the excesses of their leaders and laxity of its layity. Sooner or later Micro churches share the same charecteristics - why, not because the model is a problem, but the same sinful men are at the helm of affairs. I have seen a lot of men-of-God with `personal vision' which somehow manifests itself into a New Church, New Organisation, New Establishment. Sadly I see very few Godly men in Administration, Industry, Education, Research... who become a reference point for society and whose life creates a deep impact for what a man/woman of God can do in a the public sphere. I sometimes wonder if some of these New Vision men hide behind their more personal theology, neglecting to address the challenges posed by contemporary society, because they dont want to risk their necks doing it. Why is there no emphasis and support among the Godly in living and then leading/discipling in an excellent life. Aren't our Newspapers a sad commentary on the lack of men of good quality and the Churches failure to deliver them! Hi Saji, I did make this comment - "Of course, this pathetic condition could also be found in micro-churches if believers are not properly nurtured and discipled." Discipling people is a challenge to both mega and micro churches, particularly challenging to mega churches as the possibility of discipling people appears to be less. By God's grace, I have written a work book on "Work - A Biblical Perspective", which we use in our seminars to challenge people live a life of integrity in the workplace and impact people for the glory of God. Yes, as you say, we need godly men like Daniel in the marketplace today through whom ungodly men like Nebuchadnezzar would come to know the only true God of the heavens and the earth. I found the caption/heading on the article a little misleading. And, discipling people in a Mega Church is no more or, less challenging than in a Micro Church. While you and I can argue endlessly on the merits/demerits of the Area/Cottage meetings [followed by Mega Churches] and the opportunity they provide members to interact like in a Micro Church. We both have to answer a cynical world on why the Christian community has 1000s of denominations and why they keep growing exponentially year after year. And, dont tell me Adult baptism, Breaking the bread, Witnessing... cannot become legalistic. I do believe that the Spirit of God will move/annoit/bless the ministry of some and reject others. Yet, I cannot help but notice that Jesus, Peter, James, Paul... the early Church fathers all debated, critisised, challenged the degenerate spirituality of the so-called Godly people of their times and were persecuted [and at times even killed] by them, but nevertheless, stayed with them. No one who wants to seek a Godly life and live it, will ever be without persecution within or without the Church. This is not a personality complex but a truth experienced by all in the spiritual warfare. Otherwise what is the explanation for such blatant UnGodly practice like Idolatory, for which there is neither Old Testament permission nor New Testament sanction, to exist in some part of the Christian community as a mockery of the God of Truth! Not at Peace with some of these things. Saji.